Blackpool goalkeeper Paul Rachubka has signed a new two-year contract, with the option of a further year. The 27-year-old, who initially joined the Seasiders on loan from Huddersfield in January 2007, has made 101 appearances for the Championship side. "I'm really happy now," Rachubka told BBC Radio Lancashire. "I work hard each day to prove I'm worthy of the jersey and there's a good group of lads here who all follow that same attitude." The American-born keeper was an ever-present in the league last season, helping Blackpool avoid relegation on the last day against Watford. He has made a further 41 appearances during this campaign, again guiding the club to the verge of safety. "Our recent results may have helped us stay in the Championship and then to be rewarded with a new deal, that means it's going well for me," added Rachubka. "If you look at second-season stats for a team coming up it's always hard. "We have found it harder because teams coming to Bloomfield Road know what to expect now, but if we can keep a clean sheet on Saturday everybody will be happy." He joins Ben Burgess, Ian Evatt, Gary Taylor-Fletcher and Keith Southern in penning new deals at Bloomfield Road. And Rachubka admits their signatures made his decision to remain at the Championship club easier. "I'm happy that the club are going forward and it shows positive signs to me, so yes it was a factor," he said. "There's other factors too, with the South Stand being built, so I think everyone here is trying to push the club forward. "It's about staying safe this season and then trying to push on next term." Rachubka began his career as a trainee with Manchester United, making only one appearance for the Old Trafford club. After loan moves to Belgian League side Royal Antwerp and Oldham he sealed a £200,000 move to Charlton, the only club to pay a fee for his services. 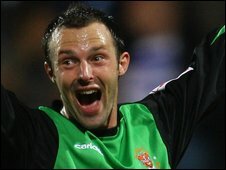 Further loan spells with a number of other clubs led to Rachubka moving to Huddersfield before eventually joining Blackpool in January 2007. The move became permanent five months later.